Japanese futurist, and innovation and technology consultant, Morinosuke Kawaguchi’s concept of Gross National Talent, is revealed in his newest book, titled “Gross National Talent: Quantitative Analysis of Amazing Japanese Soft Power“. Morinosuke Kawaguchi coined the name “Gross National Talent“. He researched and analyzed data from all over the world, from top performers and top creators. Scientists are of course included, as they are creators, too! Performers include athletes, musicians, dancers and many more talented people. Their performance and activities are calculated into the Gross National Talent Index. Morinosuke made the Gross National Talent Index after painstaking data gathering: he collected data about gold medalists in pretty much every field of every major event around the world: his book includes 114 events’ data, including the Nobel Prizes, swimming competitions, the world’s top cooking competitions, classical ballet competitions,the Tour de France, Parkour, the Cannes Film Festival and Formula 1; and the list goes on…as every major event’s gold medalists data are collected, analyzed and indexed. The Gross National Talent Index consists of 14 topics, 114 events and 350 databases for calculations. The Gross National Talent actually translates into the Brand Value of each nation. What is coolness, what is a brand, has been an enigma. 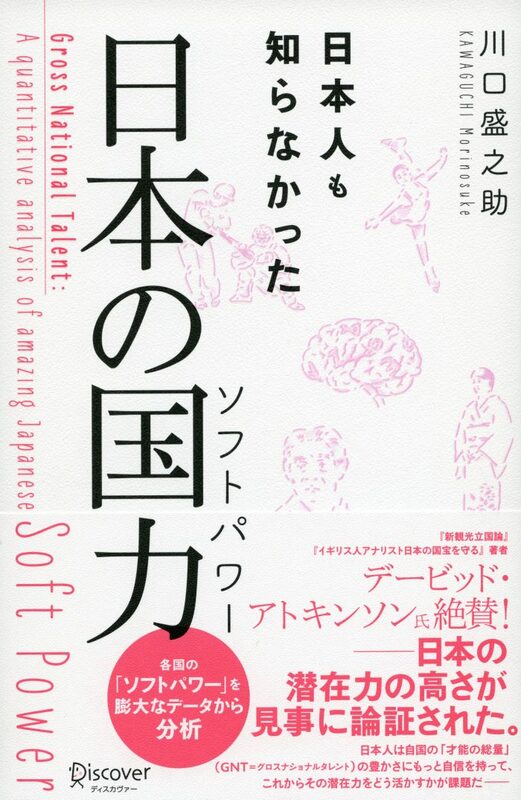 With Morinosuke Kawaguchi’s Gross National Talent Index,—finally!—, what is cool, is calculated. With Gross National Talent, the magnitude of “Coolness” is defined. Coolness is everything; it is appreciated. All brands, all countries, all people wanna be cool. The Gross National Talent Index is the most fair equation for coolness. For example, is France famous for and good at art? What about other areas? Is France good at classical ballet? With the Gross National Talent Index, the strength and weaknesses of every country can be calculated, seen with numbers. “Gross National Talent: Quantitative Analysis of Amazing Japanese Soft Power” is published on June 16th, 2016 in Japan.